Make mix, build, and finish a home or other structure. Your DVD or workshop purchase supports further papercrete research. Barry wrote a chapter entitled: "Homes From Waste Paper" in this new book. Baby bricks sent outside the U.S. will require extra postage. Above - Mr. Barry J. Fuller was honored with a Certificate of Appreciation for his work with Alcatel/Lucent building the first fully-functional papercrete home in the colonias of Nogales, Mexico. Current papercrete construction methods and papercrete research are covered in detail on this site. 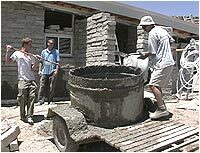 Papercrete construction involves using waste paper for affordable, sustainable housing. In the United States, we discard enough paper each year to build a wall 48 feet high around the entire perimeter of the country. Even though about 45 percent of discarded paper is recycled annually, 55 percent or 48 million tons of paper is thrown away or goes into the landfills. Figuring conservatively, it takes about fifteen trees to make a ton of paper. That means that 720 million trees are used once and then buried in a landfill each year. You Can Build Your Own Home With Paper - Here's How! Free! New Papercrete Research Reports!! materiO' of Paris has honored us by selecting BetR-blok (below) for inclusion on its list of most innovative materials. We are experimenting with ways to turn this prodigious amount of waste into low-cost, high-value sustainable housing. Given the skyrocketing costs of building materials & construction, and the pressing need for homes, it is just a matter of time before papercrete will begin to take its place as an acceptable and even desirable residential construction material. Go to Test Reports ! New DVD Construction Series! Papercrete Construction Plans ! See recent building projects under Current Projects! New! BetR-bloks and Mixers !! We have completed initial planning and testing of commercially viable new pressed blocks, called BetR-blok®. BetR-blok® is an exciting new way to make papercrete blocks which can be used to build entire housing developments in the U.S. and other countries. Above - We are also working on a 2000 gallon Mega Mixer which can pulp and mix up to nine yards at a time. The Mega Mixer is complete and undergoing operational testing now. Below - Clyde T. Curry’s imaginative designs at Eve’s Garden. Below - Tom Curry's vaulted papercrete cottage - Sunny Glen. To the greatest degree possible, we obtain our information from first-hand observation, interviews with experts, experimentation, engineering research and actual construction. However, formulas and methods evolve and change as we learn more, and any material can be dangerous if mixed or installed improperly. Therefore, please read this Disclaimer. VIDEO - Click here for Paper Palace 1. TV Interview. VIDEO - Click for new block laying Speed Technique!! Above - Paper Palace One built by Barry J. Fuller - author of this site. There are a number of ways to make construction material from paper. The generic term for the method described here is "papercrete". There are a number of variations of papercrete, such as fibrous concrete or fibercrete, fibrous cement, padobe and fidobe. See more about these variations under Mixes. Barry J. Fuller tosses blocks to Lex Terry for stacking at the building site. Papercrete is a tricky term. The name seems to imply a mix of paper and concrete, hence paper-crete. But more accurately, only the Portland cement part of concrete is used in the mix - if used at all. Arguably, it could have been called "paperment." Papercrete may be mixed in many ways. Different types of papercrete contain 50-80 percent waste paper! Up to now, there are no hard and fast rules, but recommended standards will undoubtedly be established in the future. The basic constituents are water and nearly any kind of paper. Cardboard, glossy magazine stock, advertising brochures, junk mail or just about any other type of "mixed (lower) grade" paper is acceptable. Some types of paper work better than others, but all types work.. Newsprint is best. Waterproofed paper and cardboard, such as butcher paper, beer cartons, etc. are harder to break down in water. Catalogs, magazines and other publications are fine in and of themselves, but some have a stringy, rubbery, sticky spine, which is also water resistant. Breaking down this kind of material in the mixing process can't be done very well. Small fragments and strings of these materials are almost always present in the final mix. When using papercrete containing the unwanted material in a finish, such as in stucco or plaster, the unwanted fragments sometimes show up on the surface, but this is not a serious problem. Papercrete can be sculpted into any shape and painted. Practitioners simply flick out the offending pieces as they apply the finish. Papercrete additives can be: Portland cement, sand, dirt, clay, glass, or even "fly ash" - an ash at one time freely emitted into the atmosphere - now at least partially captured from power plant smoke stacks. We are experimenting with powdered glass, rice hull ash, Styrofoam and other additives. Incentivizes the recycling of waste paper, especially in communities with no recycling services. Saves landfill space. Keeps paper processing & printing chemicals out of the water table. Saves trees and other construction resources, which would have been used in place of papercrete for walls and roof. Saves additional trees and other construction resources, which would have been used to "build out" or finish the interior and exterior of the structure. 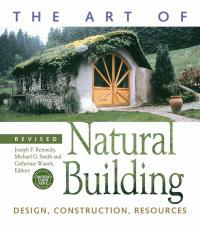 R-Value better than code - saves a significant amount of energy during the lifetime of the structure. Provides new construction jobs. Individuals and small contractors can get into papercrete. There are no harmful by-products or excessive energy use in the production of papercrete. While it can be argued that Portland cement is not environmentally friendly, it is not used in all types of papercrete, and when it is, it represents a fairly small percentage of the cured material by volume. One of the most advantageous properties of papercrete is the way paper fibers hold Portland cement - or perhaps the way Portland cement adheres to paper fibers. When the water added to the paper and Portland cement drains from the mix, it comes out almost completely clear. There is no messy and eco-unfriendly cement sediment left on the ground, running into waterways, etc. Papercrete can be produced using solar energy. The only power needed is for mixing - and pumping water. Its R-Value is rated between 2.0 and 3.0 per inch. Since walls in a one or two-story house will be 12-16 inches thick, the long-term energy savings of building with papercrete will be a bonanza for the homeowner and the environment. There will be a positive impact on employment in areas producing papercrete. Homes and other buildings of up to 3300 sq. ft. have been built with papercrete for about $25/sq.ft. That doesn't include labor, but even when labor is factored in, papercrete homes can be built, with all the conveniences, for twenty to thirty percent less than conventional housing. The preparation and installation of papercrete does not require significant outlays of capital or a great deal of additional training. Individuals and new or existing small construction enterprises can add papercrete to their businesses for very little extra money or time. Papercrete batch plants, for building entire sub-developments, are in the prototype stages now and will be available soon. These operations will cost more, but still be within reach for the small sub-contractor. © 2007 Living In Paper. All Rights Reserved.